Kenny Churchwell, the three-star safety prospect from Phoenix (Ariz.) Mountain Pointe, announced at his high school Friday morning that he had committed to UCLA. 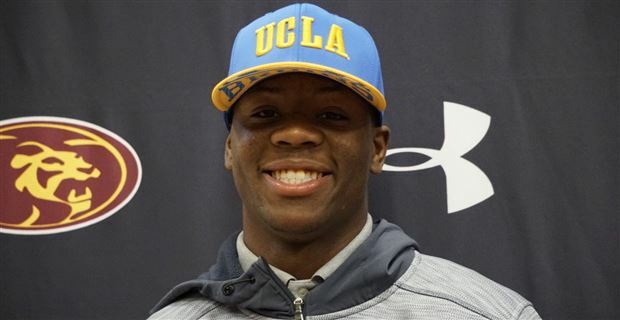 Churchwell chose the Bruins over his other two finalists, in-state Arizona and Arizona State. Churchwell keeps UCLA’s streak this week alive, his commitment following those of receiver Delon Hurt and linebacker/safety Je’Vari Anderson. Churchwell is UCLA’s third defensive back commitments for 2018 — joining four-star safety Stephan Blaylock from Bellflower (Calif.) St. John Bosco and three-star cornerback Patrick Jolly, of Lithia (Fla.) Newsome. It’s UCLA’s 16th commitment overall for 2018. The Bruins could end up signing a total of around 24 by National Signing Day on Feb. 7th.